Aiden McGeady has been passed fit to appear on his home pitch and the Spartak Moscow winger will have to have a big influence on this game if Republic of Ireland are to beat Russia. Ireland have managed just the one win against Russia in six meetings, but the Irish away form is strong and there is plenty of belief in the Irish camp. Russia have been in solid form during the qualification campaign, winning five, drawing one and losing one of their games so far. Meanwhile, Ireland are currently two points behind with a four wins, two draws and just the single defeat. The last meeting between the sides saw Russia run out 3-2 winners in Dublin last October. A win looks a little beyond Ireland who haven’t beaten a team above them in the FIFA world rankings for a decade – especially with John O’Shea missing and worries over Robbie Keane and Shay Given. Ireland haven’t lost a single one of their previous 12 away games and with Russia losing against Slovakia and Belgium in Moscow recently, backing Ireland to get a draw at 5/2 looks worth a punt. Goals look like being at a premium in Moscow with Ireland keeping things tight at the back in recent games and Russia scoring more than one goal in just one of their previous nine games. Ireland have kept a clean sheet in all of their previous six games, while none of their last five games have had more than two goals. With only one of Russia’s last nine games yielding over 2.5 goals, backing under 2.5 goals at 8/15 looks the bet. 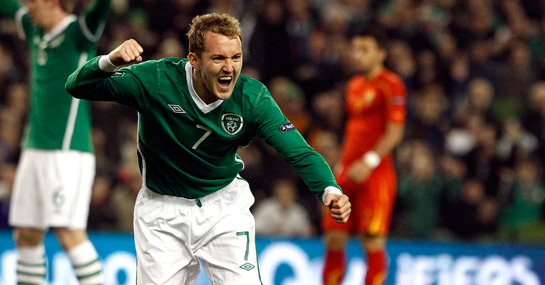 McGeady is 16/1 to get the first goal and on a pitch he knows well, the Irish will be hoping it’s the decisive goal.